If you're looking for the practicality of a mid-size SUV that is also luxuriously appointed and enjoyable to drive, check out the 2015 Acura MDX in Peoria. The spacious and upscale cabin, along with strong fuel economy and performance are all among the reasons 2015 Acura MDX reviews cite this three-row luxury SUV as outstanding. The cabin is quiet, plush, comfortable and spacious. The second row offers generous legroom and has the ability to slide back and forth to adjust space for the third row. You'll also find that third row easy to access - a boast most vehicles in this class cannot make. Standard amenities include satellite radio, a rearview camera, tri-zone automatic climate control, USB and auxiliary inputs, Bluetooth, an infotainment system with an 8-inch touch screen, proximity key, push-button start, leather-trimmed seats, heated front seats and a power liftgate. Test-drive a 2015 Acura MDX in Peoria. Acura's excellent 290-horsepower 3.5-liter V-6 engine is now fed with direct injection and enhanced with the full array of Earth Dreams technologies. That engine is teamed with a six-speed automatic transmission that includes steering-wheel paddle shifters. Front wheel drive is standard, but Acura's SH-AWD is available. This system can adjust torque distribution between the front and back or left and right wheels to provide more all-weather traction and improved cornering control in some situations. Even in today's more safety-conscious automotive environment, few vehicles can boast the vaunted safety record of the Accord MDX. 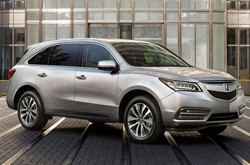 The IIHS awarded its Top Safety-Pick Plus rating and the federal government awarded the MDX five stars. Celebrated for its superior quality, safety and family-friendly cabin, the MDX offers an excellent combination of luxury, power, price, and more importantly, high owner loyalty. It is no wonder that in its 2015 Acura MDX review, Edmunds.com concluded, "The 2015 Acura MDX is a top pick for a three-row luxury crossover, offering abundant refinement, luxury and comfort at a relatively reasonable price.